Where did Tartan come from? One of the problems with charting the birth and progress of tartan is that the very word itself is relatively modern and restricted to the English language. Many other countries had – and still have – no such word, so we have to be content with painted . . . variously coloured . . . . several colours . . . divers colours . . . sundry waies devided and mottled garments. Even where the description tartane is used, it needn’t necessarily mean tartan as we know it today – it was, for quite a few generations, used to describe a type of cloth and not necessarily the design in which it was woven. The elements are also against the tartan historian in that cloth is a very transient artefact – a mere speck of dust on the archaeological timeline . . . except when it happens to end up in a medium that preserves it such as a peat bog, a salt mine or an arid desert. It is the last of these that we have to thank for our earliest tartan remnant which was woven between 700 and 1200 BC – about the same time that the Greek goddess of love Aphrodite was emerging from the jade-coloured sea off the south coast of Cyprus! So, to where did tartan disappear between 1200 BC and the 16th century? The late Jamie Scarlett MBE, this generation’s most eminent tartan historian and quiet debunker of its associated romantic myths, suggested that it was always there but no-one thought it unusual enough to mention, and it wasn’t until visitors began to venture into North Britain and saw the Scotch savages in their quaint dress, that it became noteworthy. 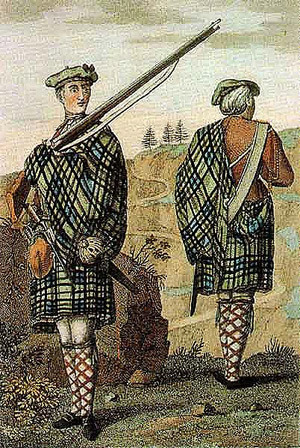 In their European travels, Scottish mercenaries also excited great comment about their outlandish dress and even back then, what they wore under it was a matter of great conjecture amongst the ladies of the day. History suggests that the Celts originally came from the south-east of Russia around the Caspian Sea and gradually expanded westwards – once they arrived in mainland Britain they couldn’t progress any further west than Scotland, Ireland, Wales, Cornwall and Brittany(France) . . . and so there they remained. The location and topography of western Scotland and the Highlands meant that they were more isolated than their southern kin and so the old skills survived for much longer . . . long enough for the rest of Britain to notice the quaint costumes and for happenstance to enter the arena in the form of George IV, Sir Walter Scott, the Sobieskis and Queen Victoria, all of whose enthusiasm for Scotland, the Scots and the tartan-clad Scottish regiments, ensured ‘immortality’ for tartan. Here we offer you an historical timeline from 1200BC to just prior to the 1745 rising. Some of the gathered quotes (especially the earlier ones) have been taken on trust, so if you know better – please let me know! Similarly, if you’ve come across stronger quotes than those featured, please do submit them with full details of the source. 750 -1200BC Tartan fabric found on mummified bodies of Caucasians in Urumchi, China. Tartan scraps found in Celtic salt mines at Halstat in Austria. 100BC “The way they (the Celts) dress is astonishing: they wear brightly coloured and embroidered shirts, with trousers called bracae and cloaks fastened at the shoulder with a brooch, heavy in winter, light in summer. These cloaks are striped or checkered in design, with the separate checks close together and in various colours.” Diodorus Siculus, Greek Historian. 30BC ( Circa) “Their cloaks are bright and shining” Virgil’s Aeneid, Book VIII. 230AD Falkirk ‘tartan’ found in jar of Roman coins. 1355 “unus caligarum braccatarum de tiretatana” translated as “one pair of tartan trews” (Among the expenses of John, Lord of the Isles.). John Major in his 1521 History of Britain. 1549 “The clergy wear only round birettas and shall always take off their caps in churches, especially in choirs and in time of divine service and not dress, as for example, in top-boots and double-breasted or oddly-cut coats, or of forbidden colours, as yellow, green and such kinds of parti-colour.” Provincial Council of Prelates and Clergy: Edinburgh. 1549 “ . . . the Highlanders . . . they have painted waistcoats, and a sort of woollen covering, variously coloured.” John de Beaugué at the siege of Haddington. 1561 John Cuthbert fails to pay to John Coupland “ane tartane blew and greyne in compleit payment.” R.M.D.Grange FSA Scot. .
1566 Dunsleye is sued for payment for “an tartan blak and quhet…” R.M.D. Grange. John Lesley, Bishop of Ross, De origine, moribus et rebus Scotorum. (James Aikman’s translation from the original Latin by George Buchanan). 1594 A body of auxiliaries from Scotland helped Red Hugh O’Donnell, Lord of Tirconall, in Ulster against Queen Elizabeth. These warriors were described by Peregrine O’Clery as wearing “ a mottled garment with numerous colours hanging in folds to the calf of the leg, with a girdle round the loins over the garment.” R.M.D. Grange. John Taylor, the “water poet”, on a visit to Braemar. “William Sacheverell, Governor of the Isle of Man, observing the dress of the Isle of Mull. Martin Martin, Western Isles of Scotland. 1711 Reported that tartan was being exported to London where there was a trade in tartan bed hangings, curtains and nightgowns. Tartans and Highland Dress. C.R. MacKinnon. 1713 The Royal Company of Archers adopt a uniform incorporating – “Stuart tartan coat lined with white shalloon…” Company records quoted by J. Telfer Dunbar. Captain Edward Burt’s Letters from a Gentleman in the North of Scotland. 1740 Two cargoes from Leith to London included 9,406 yards of tartan. From the Caledonian Mercury and quoted in Tartans and Highland Dress by C.R. MacKinnon. Thank you for taking the trouble to respond – glad you liked it.